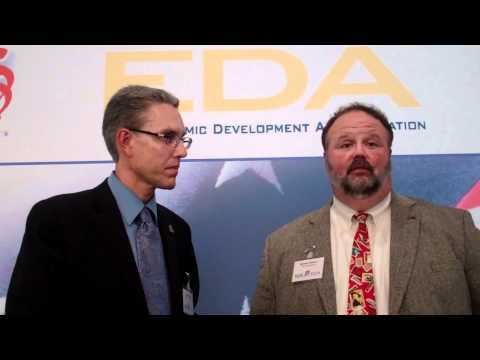 Trevor Hamilton, Vice President of Economic Development & Chief Economic Development Officer, Chattanooga, Tennessee and Michael M. Philpot, Executive Director, West Tennessee Industrial Association, Jackson, Tennessee talk about the EDA/ITA Trade and Investment Program to Hannover, Germany. Hamilton and Philpot are both economic developers attending Hannover Messe 2011 to look for investment opportunities for their regions. By participating in a trade show as globally significant as Hannover Messe, with the help of the Trade and Investment Program, they are able to promote their communities to foreign markets in a way that they couldn't with their normal resources.